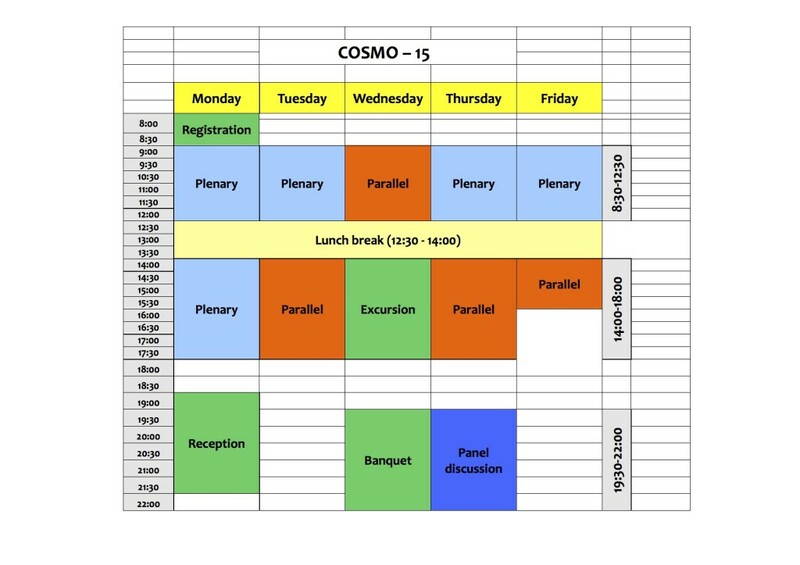 A final timetable with slides can be found on INDICO and is included here in pdf format: timetable_COSMO_2015. Poster session: Dear authors, please send us (mail: cosmo15@ncbj.gov.pl ) files (preferably pdf) with your poster to publish them on indico. Plenary talks are allocated 30 minutes, with 5 additional minutes for questions. Parallel talks are allocated 17 mins, with 3 additional minutes for questions. Please send us your talk no later than the morning of the day of your talk. A recommended way is to upload it using the facility provided on the conference webpage under Talk Uploading (http://cosmo15.ncbj.gov.pl/talk-uploading). Alternatively, you can send it by email to cosmo15@ncbj.gov.pl or else hand it in to one of the local organizers upon arrival. Those of you who have an account in Indico are welcome to submit your talk directly there. Important: files in pdf or powerpoint format only will be accepted. A block schedule of the meeting: cosmo15_schedule_150826. A final list of posters: cosmo_posters_final. NOTICE: A recommended poster size is B1 (707 x 1000 mm) or similar (A0, A1).